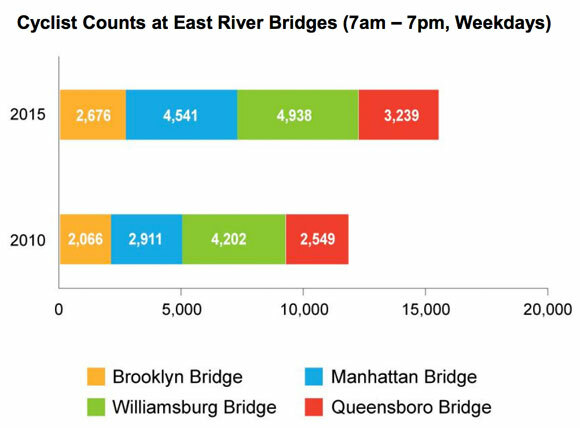 What all these data show is that there are increases in all cycling trips — across all boroughs; commuter (+75% in Brooklyn from 2010–2014) and infrequent riders (+8.7% from 2013–2014); and across all East River bridges (+41% from 2010–2015). The pushback on this release, however, is what the data do not show. 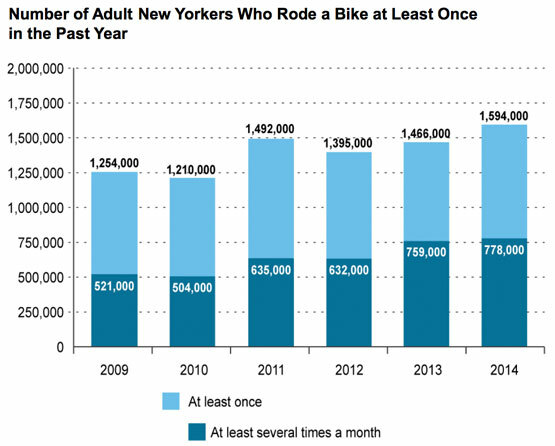 The data shown do not include key points of bike traffic that were included in previous years — i.e., the Hudson River Greenway and Whitehall ferry terminal. There is a valid point here — besides not being able to compare with some previous metrics, why not provide access if the data is there? Providing access on an open-data portal would allow for the many organizers and initiatives outside of the DOT to do their work more effectively. While all data presentation has to start somewhere, and the most appropriate place to start is where data is heaviest, these points leave a lot to be desired. For those interested in assessing and improving bikeability of the outer boroughs, for example, there’s not much to use here, though surely there is in the data that’s not part of this snapshot. Cycling in the city will always require both a top-down and bottom-up approach to organizing and initiatives, and so the data should be available across all of these levels.